A couple of things have cropped up e.g. passenger side electric window not working and the discovery of two very rusty and loose nuts on the exhaust pipe where it bolts onto the bell-housing. 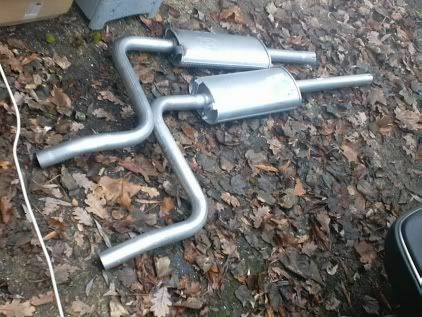 These were responsible for very noticeable rattles when the car was between gears and coasting down hill in particular! 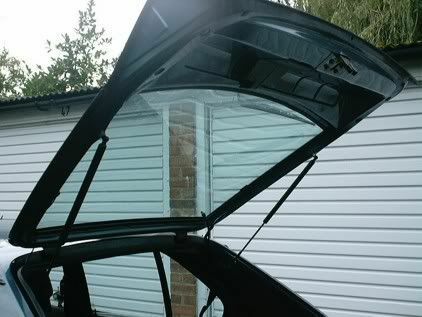 Anyhow these little problems have been fixed in early Jan 07, thanks to having a spare electric window motor in the loft. Still need to sort the mileometer which stopped working and will try to do this by replacing the whole dashboard. 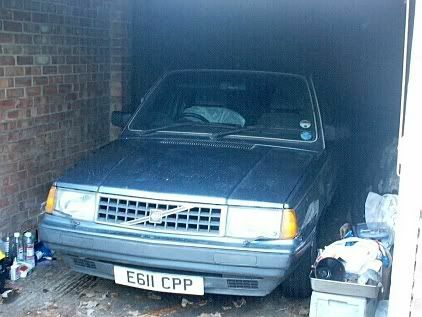 The weekend of 14 Jan 07 has seen a second-hand dashboard aquired from someone local scrapping a 1984 GLT. The dials are in superb condition but have different styling and the speedo has a different cable fitting so isn't going to work. 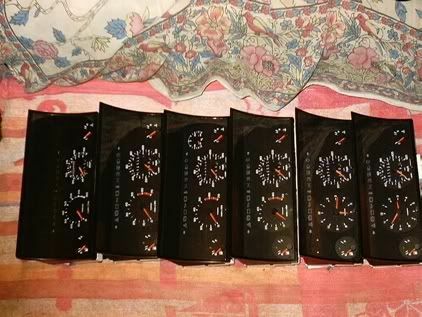 Hence a second hand 340 dashboard was retrieved from the roof and the speedometer was fitted to Bess's old dashboard. 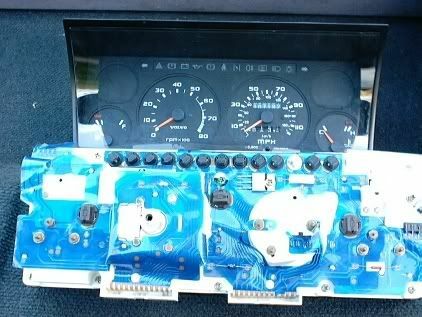 Some efforts to repair the old speedometer didn't get anywhere so decide to try the one from the roof in the car. With the dash back in the car, much agro was had trying to reconnect the speedometer cable but eventually this sorted and a drive around shows that it works OK and the mileometer is functional too. Those speed check-cameras which flash your speed at you are handy for checking your speedometer calibration. Slight niggles are that the mileage is now 10k less than it should be and the numbers on the last digit look worn so someone has probably diddled the mileage (I can explain everything, m'lud). Prior to this I had managed to find someone selling a couple of old dashboards and, in the mental maelstrom, I decided to get these. When they arrive, I will decide whether to use one of these instead. It is now mid-late March and the last few weeks have seen several more attempts to get and fit a decent jitter-free speedometer and finally I seem to have had some success with this. The photo will testify that this quest has seen an embarassing number of consoles purchased and dismantled. 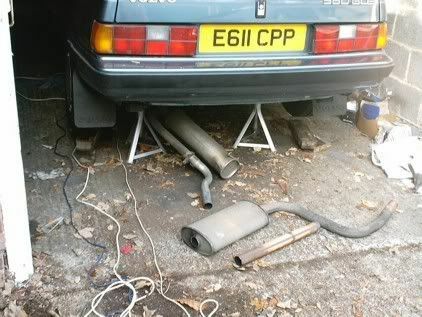 The car has also had the necessary welding done to the box section near the petrol tank and the garage was also asked to see if they could sort out the brakes. 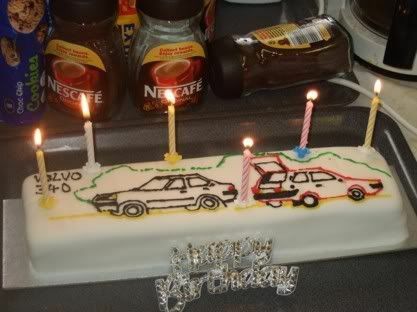 Alas, they re-tested the car and said that all was OK and I would just have to live with it. Its tempting to do nothing but that pedal is just a bit too hard on the right foot so I order some uprated pads and these arrive in a box proclaiming some award from MaxPower. Apart from that they are unbranded and, without much change from �50, I am wondering if I have been maximally ripped-off? Anyhow, as feared these pads did not make any appreciable difference apart from giving me the dubious satisfaction of knowing that they are new. So now to the servo as the next object of attention and some progress has been made in starting to remove it although undoing the four nuts on the interior of the bulkhead will need a long 13mm socket which is the next thing on the mental shopping list. The servo was eventually removed and posted away to J & L spares who turned around the repair work with lightening speed - a mere 13 weeks. During same said turn-around period, Bess (sadly) saw no useful work at all done on her. In fact during this period someone even tried to break into her garage. In some despair at the timescale of this refurb, a second hand servo was purchased, but on trying to fit this to the car, I accidently pull out the pushrod which goes into the master cylinder. Very sadly, this cannot be refitted without taking the whole servo apart, which requires more equipment that I have at my disposal. So its back to the waiting game of making patient phone calls. Early July 07 saw the servo returned and it was refitted to the car in great haste but there is much difficulty trying to bleed the system and Bess refuses to start so I cannot even get help from the servo. After much meddling about, the starting problem was found to be an airlock in the fuel hose. 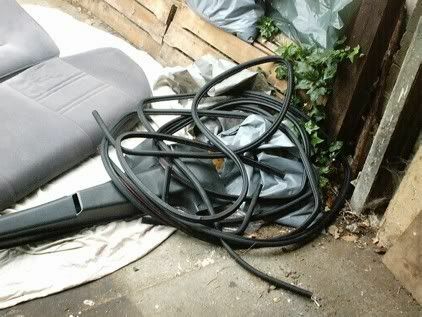 A few mouthfuls of petrol resolved this problem and one of the offending hoses was replaced with new. However, I am still unable to bleed the brakes through and so I purchase an Eezibleed kit. This finally allows the brakes to be bled. A quick run around the block revealed that all was not well since the front brakes progressively seized up. The brakes freed themselves after an hour or so of cooling down. However driving the car again the following weekend also produced the same effect. With kind and helpful advice from the volvo300mania site, I decided to replace the Black Diamond pads with standard ones (from the attic) and these were fitted in late July. 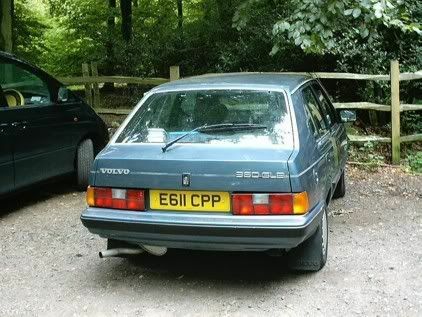 However the problem remains - the car could only be driven in first gear and the brakes became perilously hot and smoked profusely. 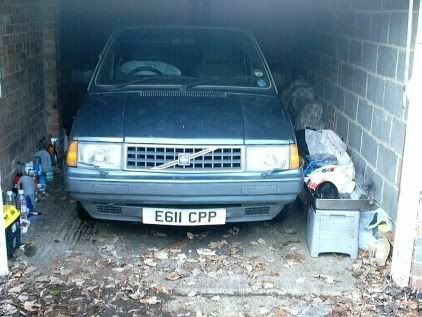 So I decide, in despair, that it must be the master cylinder which I have probably knackered trying to bleed the brakes. Hence a refurbished master cylinder was found in the attic and work (see below) has begun on removing the old master cylinder and replacing it with the new one. There's no rest for the wicked. 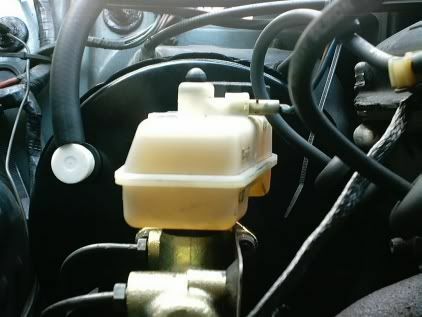 The weeks into August 07 have seen the master cylinder replaced (see below piccy) and the system re-bled. However a test run shows that we still have the same problem as before - it had to happen. Hence I decide to continue taking the car for small runs in the hope that this will somehow bed in the pads and cure this little problem. However a weekend or two later, its pretty clear that the problem is not getting better, in fact it might be getting slightly worse. 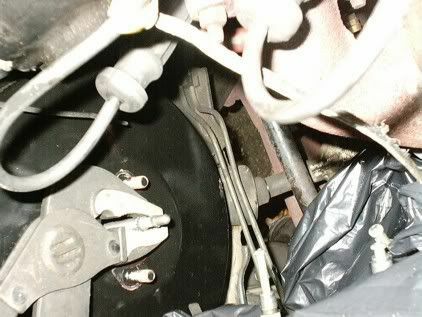 A fairly desperate search of the internet turns up an interesting site on brake problems which says that progressive binding of the brakes when they are hot is due to the push rod(s) in the servo not being adjusted correctly. Interesting. 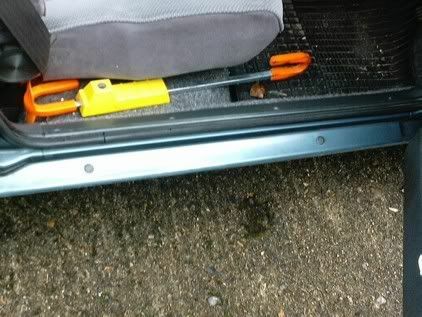 If the push rod is too long, the brakes are permanently on, albeit only slightly. Also, since the piston in the master cylinder is not in its correct resting place, the brake fluid, which expands when the callipers get hot, cannot flow back into the reservoir. 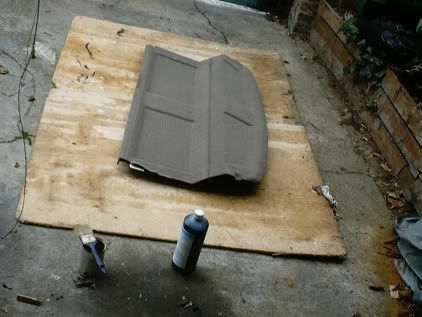 Hence the hotter the brakes get, the more they bind. This would explain why I was unable to push the master cylinder right up against the servo without doing up the nuts with a spanner. It would also explain why I had much difficulty bleeding the brakes and had to resort to pressuring the system with an Eezibleed. There may be light at the end of the tunnel. Hence I decide that the firm which refurbished the servo must have changed the pushrod adjustment or fitted a new pushrod altogether. I work out how to adjust the same said pushrod by looking at a spare servo and decide to set it to the same length as that on the spare. 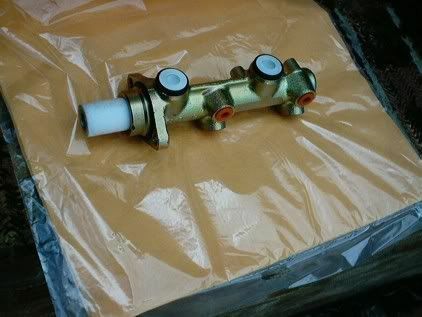 This is the plan and implementing it will mean draining the system and removing the master cylinder all over again. It had to happen and its awful but I love it. 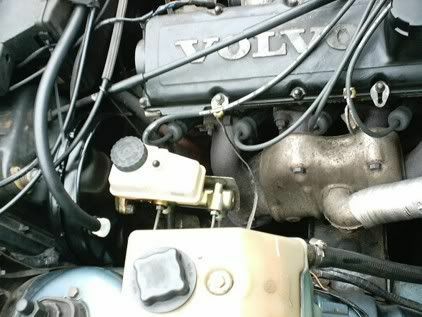 The weekend of 19 Aug 07 has seen Bess's master cylinder removed and the servo pushrod has been adjusted. This required the use of some water pump spanners as shown below to hold the rod so that the adjuster could be tweaked with a 7mm spanner. 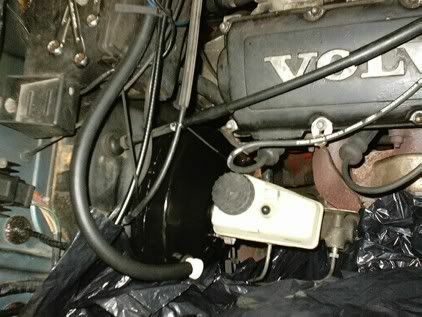 The master cylinder could then be pushed up against the servo without any force and was torqued up. The system was bled, the brake pads regreased on the back and one or two other tidying up bits done. The car was finally taken for a run and to my great relief the brakes now work satisfactorily with no binding and car can even be skidded if required. The pedal sinks a bit low towards the floor which takes a bit of getting used to but I don't think its the adjustment because the pedal stops rock hard very high up when the engine is not running! Its 22 August 07 and Bess manages to sail through the MOT with only minor welding required to sills (thought that was done a year ago) so the brakes must be passable now....and, of course, its a certain anniversary, so a colleague at work kindly prepared the below item, preserved here for posterity. The required welding was where jacking Bess up for brake repairs had damaged the sills. The last weeks of August 07 have seen Bess given a quick spruce up inside and out and returned to use as daily transport. 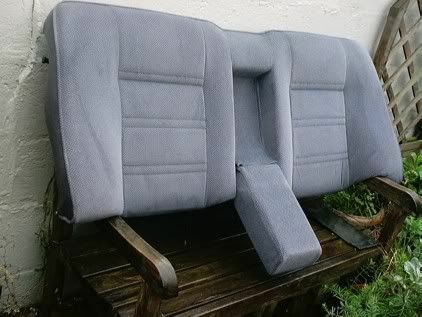 A new (or rather vgc second-hand) driver's seat belt has been fitted but the trim panel behind will need replacing since it was broken by one of Bess's previous owners (honest) and the remaining niggle in the back of my mind is that buzzing sound from under the dashboard when the wipers are on intermittent wipe. Perhaps all the relays need swapping. As fate would have it, Bess's first run (in a long time) to the North Downs (see below) saw the windscreen chipped by a pebble from the naughty car in front. The weekend of 28 Oct 07 has seen much activity on the Blue Bess front. The previous 2 weekends had been spent fitting new locks to her garage - someone really broke in this time and took my little generator. Anyhow, back to the present and Bess was driven to High Wycombe for collecting more spare parts which included a new front passenger seat belt, new hatch struts, new door seals, trim panels and, most importantly, the mounting for the steering column switches, to cure the tendency of the indicator switch not to self-cancel. 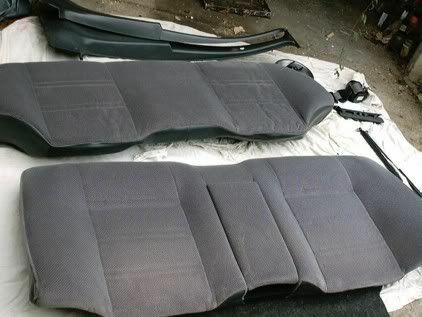 A new back seat was also acquired and was cleaned up for fitting to Bess asap. The seat belt and hatch struts were fitted to good effect - they work much better than the old ones. The new drivers' door seal is a triumphant success, too. On the road, Bess has developed slight bearing noise from the front at around 40mph which tells me to tighten the front wheel bearings asap and the middle section of the exhaust is blowing. Strangely the onset of the bearing noise seemed to coincide with the tyres being pumped up rather generously - could these events be related? The plan is to rectify these problems over the next few weekends and fit the switch mounting as well as topping up the gearbox and diff oil. The car was also given an oil change at 94k miles - perhaps this has made the engine a bit quieter so I now hear the exhaust and bearing noise, or is it just the ability of the human ear to home in on the faintest sound and what sounds deafening to the anxious beholder is imperceptible to anyone else? The weekend of 2 Nov 07 saw intense activity on Blue Bess with the replacement of the steering column mount for the indicator and windscreen wiper switch (see below). A test run shows that the new mounting has brought on a new era of stability for these switches. Then Bess was raised, at times precariously, on stilts for replacement of the centre section of the exhaust. 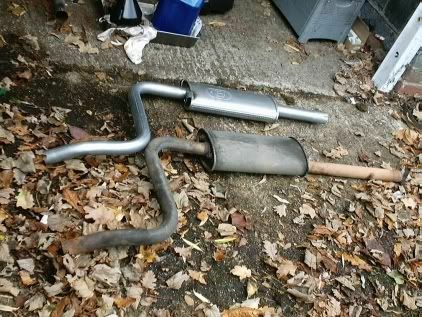 The old exhaust was removed with the help of a Dremel. Many broken disks, rubber rings and bolts later the old centre section came off, miraculously without any apparent damage to the front and rear sections which are going to be re-used. The gear box and differential oils were topped up and the front wheel bearings were opened up for re-greasing and re-tightening. The weeks in the middle of November 2007 have seen much effort to replace the broken centre section of Bess's exhaust pipe. A new section was purchased from the great auction house of the internet but, on arrival, this turned out to be too short by about a foot. 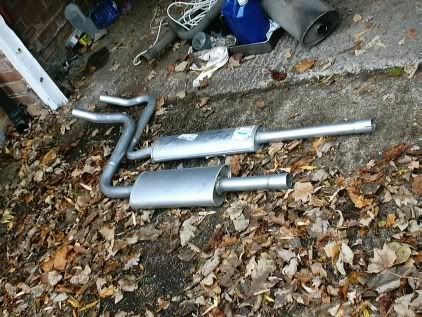 A trip to the local spares shop led to a new section being delivered 2 hours later (not bad for a saturday morning) but on trying to fit this to the remaining sections of the old exhaust, it was clear that it was too narrow. In despair, a trip back to the same spares shop led to a wider pipe being ordered and this was collected the following weekend. However, I found that this too could not be fitted to the downpipe from the manifold due to it being too narrow and lacking any sort of flange at the front end. Hence a trip was made to the local Kwikfit to try and get them to widen the end of the pipe a bit. However, the duty manager searched in vain for the dolly to hammer out same said pipe and returned saying that one of the mechanics must have taken it home! However, he kindly directed me to another exhaust place that was open on Sunday and a trip there finally led to the offending end of the pipe being opened just enough for it to fit onto the downpipe. In a couple of hours the exhaust was all back together again with generous portions of gun gum on the joints and quick test run of the engine on idle revealed (thankfully) that the exhaust was not blowing. The weeks up to the end of November and into early December 07 have seen Bess returned to use for daily transport resplendent with new exhaust middle section which seems to be working impeccably. After swapping the biggest relay on the steering column, the windscreen wipers no longer 'buzz' on slow wipe. 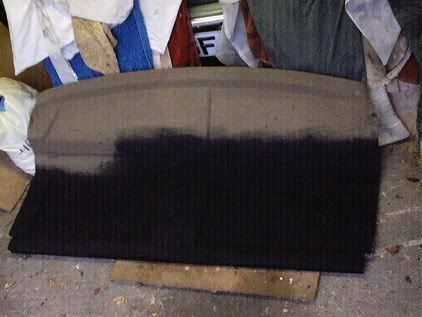 The rear seat back has been replaced and a new (old, faded and slightly damaged) boot board has been repaired with papier mache, repainted and the carpet re-dyed. It seems to look pretty good on the car, in my unbiased opinion. 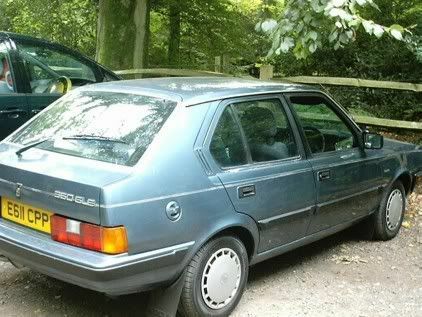 The only slight niggle is the noticable bearing noise which seems to come from the front, driver's side. Not bad for new bearings after 3000 miles which have just been re-greased and re-tightened. However, feel slight guilt that on removing the wheel cap, the grease cap, which had worked itself loose in rainy weather and emptied its contents over the tyre wall by centrifugal action, then tumbled onto the gritty floor. Nevertheless will try to clean everything up and re-grease again, hoping for the best. The weeks up to the end of December 07 have seen a reccurrence of Bess's servo trouble. During a 70 mile drive, I felt the brake pedal becoming suspiciously hard and, on arriving, there was a strong smell of burning brake pads. Trying desperately to ignore the immediate panic reactions which were to drive home, to go to nearest garage, etc, etc, every spare moment in that fateful day was spent mulling over what was best to do in the situation. I remembered that the sticking brakes had previously been caused by the servo pushrod not allowing the master cylinder piston to return to its correct position. Perhaps something was causing a reccurrence of this and perhaps the brake pedal was sticking and partly jamming the brakes on somehow. Perhaps the severe cold had caused all of this and the problem would go away on a warmer day. The return journey confirmed that the brake pedal was indeed jamming. 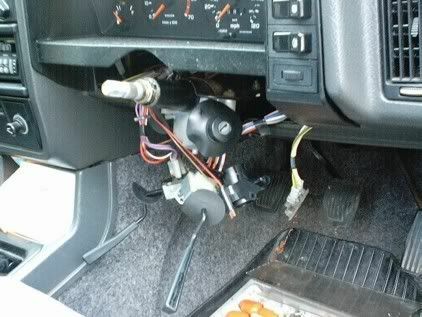 The problem could be solved by pulling the pedal back to its normal resting position after braking. The car was driven in this way for another day or so until the problem worsened and I decided to put the car away again in the garage. During the next weekend, which was a bit warmer, some efforts were made to waggle the brake pedal backwards and forwards to try and free it up but this didn't make any difference and now the servo makes an unhealthy graunching sound each time I pull the pedal back. So much for a professionally refurbished servo. So it has to be said that this has been the year of the servo and I must raise my hat to it for defeating me on all fronts. Anyhow, the battle is not over and with just a little round black box lying between Bess and her freedom, I can think only of those timeless Buggles words... In my mind and in my car, we can't rewind, we've gone too far.